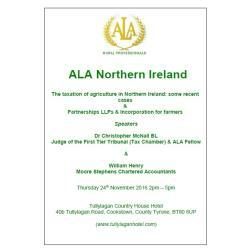 ALA is pleased to invite you to the latest in its series of CPD events which will examine some recent cases on the taxation of agriculture in Northern Ireland and options for farm businesses in terms of partnerships, limited liability partnerships or incorporation. 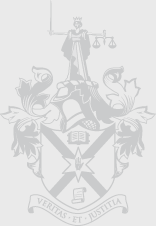 Dr Christopher McNall is a graduate of the University of Oxford and Jagiellonian University, Krakow, Poland who after teaching law at the University of Oxford and University of Cardiff was called to the Bar in 2005. He is regularly instructed in agricultural disputes of all kinds, both before the Courts and in arbitrations, including disputes about tenancies, partnerships, land, planning and environmental law. A Fellow of the Agricultural Law Association he gives seminars nationwide on agricultural law and was recently the Judge in the First Tier Tax Tribunal case of Allen v HMRC (http://financeandtax.decisions.tribunals.gov.uk//judgmentfiles/j9081/TC05100.pdf). 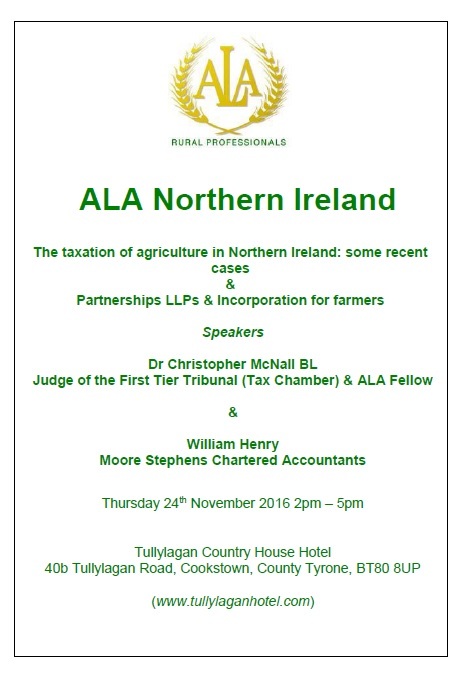 William Henry in addition to farming himself is the agriculture tax partner with Moore Stephens LLP based in their Limavady and Larne offices. William is has been an accountant for more than 20 years and is also a chartered tax adviser and chartered financial planner as well as providing a range of general accounting services to clients. He has also been one of Northern Ireland’s longest serving members of ALA and taken part in panel discussions at previous ALA Northern Ireland events. Numbers are limited to 60 delegates and places will be allocated on a first come first served basis.